Recently I was scanning in a few hundred pictures from a box my mother had in the pole barn. I ran across this photo of my grandmother, Mary Rose (Stroik, Kasper, Karpuk, Dreffs) Romaine. She is kneeling in a cemetery. At first I didn’t take much stock in this photo. Then, I tried to figure out when it might have been taken. I got to thinking… I’ve seen that style of gravestone before. A closer look at the image showed that the grave she is next to is one of Andrew Allen Kolba. I know this because I can compare it to pictures I look of this location on that trip in 2000. This must have been taken in Floral Gardens Cemetery in Bay City, Michigan. I took a trip there in August 2000 to photograph the grave of my grandfather, but his grave is not in this picture. I looked at this picture again and noticed that Grandma was kneeling in a peculiar location. Then it hit me! 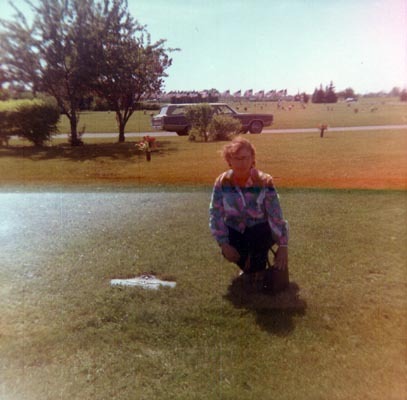 My Grandma is kneeling at the burial site of her late husband, my grandfather Walter Anthony Dreffs. The cemetery office told me that my Mom purchased a marker for her father on January 19, 1972. Grandma must have been showing my Mom where her father was buried so she could buy the marker. 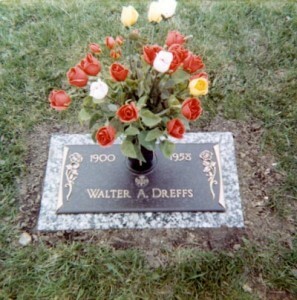 Walter Anthony Dreffs is buried at Floral Gardens Cemetery in the “Garden of the Last Supper”, Lot 209, Space D.